A broadcast journalism student at the Newhouse School who is a diehard Yankees fan, was an NBC intern at last year’s Sochi Olympics and appears as a contestant on “Sports Jeopardy!,” a web show on the online television network Crackle. 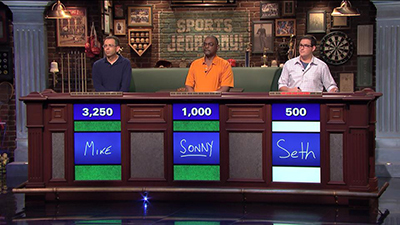 Seth Golberg, right, plays “Sports Jeopardy!” against two other contestants. Goldberg ’16 was one of only a handful of sports enthusiasts out of 30,000 applicants who made the cut for the show that is based on the popular “Jeopardy!” syndicated television series and produced by Sony Pictures Television. Shot last fall in Los Angeles, the episode Goldberg appears on will be released Wednesday, Feb. 4, on the Crackle site and its various platforms. 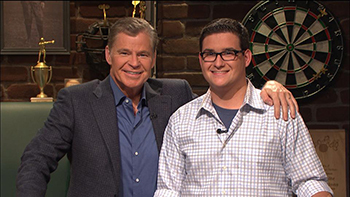 The weekly series started last fall and is hosted by national sportscaster Dan Patrick, who appears on NBC. The contestants vie for points and the top three over the season will return to face off for $50,000. Goldberg, who can’t say how he did on “Sports Jeopardy!” before it broadcasts, applied to be a contestant through the series website and was asked to participate in a test in New York City last summer. His scores were good enough to send him on to the show in Los Angeles for taping. “It was on the real ‘Jeopardy!’ set, but they redesigned it to look like a sports bar. It is really cool,” says Goldberg, who also taped a pre-round interview. Goldberg, who had met Patrick previously during an intern dinner event while at the Sochi Olympics, has been watching sports as far back as he can remember and his parents are both sports fans. “I can remember as early as elementary school waking up to watch SportsCenter in the morning or one time when the Yankees played in Japan I woke up to watch them before heading off to school,” Goldberg says. He’s also, of course, an avid fan of college sports. “I don’t know of any better atmosphere than having been with the 35,000-plus people in the Carrier Dome for the SU-Georgetown game or with a 100,000-plus audience at Penn State for a football game,” he says. Although he can’t talk right now about the show itself, Goldberg says he had a lot of fun and the best part of the experience was how it all happened.